In Brief: Mattel's miniature galactic grapplers from the 1980s have attracted a fiercely loyal cult following. Mattel released its first WWE figures in 2010, but it wasn’t the first time the toy giant has produced wrestling items. Back in the 1980s, Mattel flexed its M.U.S.C.L.E. and offered up roughly 236 miniature galactic grapplers. The M.U.S.C.L.E. figures were based on a Japanese toy line of the popular Kinnikuman cartoon. They were sold in the U.S. from 1985 to 1988, and peaked in popularity during the summer of 1986. M.U.S.C.L.E. stood for “Millions of Unusual Small Creatures Lurking Everywhere,” and anyone who found the small, flesh-colored toys stuck in their carpet or laying around their home certainly found that name appropriate. The original M.U.S.C.L.E. figures were peach flesh colored and were sold in packages of four, ten, or 28. Because all of the packages contained a random assortment of figures, collecting the entire 236-figure collection was very difficult. Kids often wound up with dozens of duplicates, which is good for collectors today; large lots of these toys often surface on eBay for reasonable prices. In later years, Mattel began incorporating neon-colored versions of the same figures, and eventually scrapped the flesh-colored figures all together in favor of the colorful neon toys. In addition to the figures, other M.U.S.C.L.E. merchandise included a board game, Nintendo video game, a toy championship belt and a small ring. In the early-2000s, Galactic Wrestling was released for the PlayStation 2, featuring characters from the M.U.S.C.L.E. toy line. 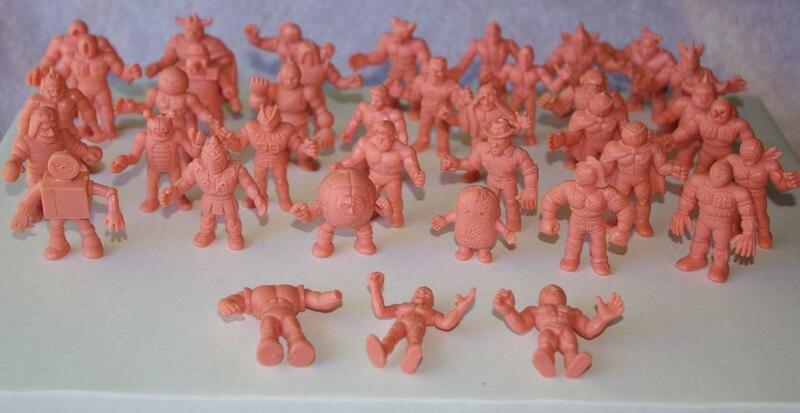 Today, there are hundreds of M.U.S.C.L.E. auctions on eBay at any given time. Searching for them can be somewhat tricky, since the word “muscle” brings up hundreds of thousands of results. Popular search terms for these figures include “M.U.S.C.L.E. men” and “M.U.S.C.L.E. lot." Large lots of figures are often offered for sale. A complete set of 236 toys recently fetched $300 at auction, while a big bundle of 750 toys sold for $356. Most of the individual figures can usually be found for 50 cents to $3 each, but buying in bulk usually makes more sense in order to save on shipping. Some individual figures are incredibly expensive and difficult to contain. Figure #153, a giant hand named “Sunigator” (and often referred to as “Claw”) usually sells in the $75-100 range, and one recently sold for $137.50. This figure was very common in the early days of M.U.S.C.L.E., so the outrageous value is somewhat perplexing. Over the years, rare figures and previously unknown variants began to pop up. As recently as 2009 collectors were discovering obscure M.U.S.C.L.E. toys that were never announced or included on a mailaway poster that also served as a checklist. The most popular of these is a four-armed figure often called “SatanCross,” which usually sells in the $50-75 range. 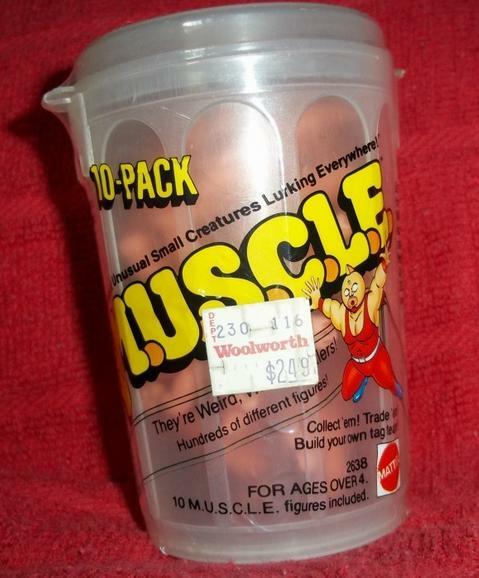 Unopened M.U.S.C.L.E. toys are somewhat tough to come by and sell at higher prices. An unopened trash can-shaped package of 10 figures recently sold for $118. The package in this auction still had the original $2.49 price tag from Woolworth affixed to it. Collecting M.U.S.C.L.E. toys can be as simple as tracking down your favorite flesh-colored figures from your childhood or going all in and chasing all of the rare figures and color variations. Before spending too much on these toys, check out these and other resources that are available online. - Collector’s guide to buying M.U.S.C.L.E. toys on eBay: Reviews.eBay.com . - Little Rubber Guys: LittleRubberGuys.com . - M.U.S.C.L.E. checklist: MuscleFigures.com . - University of M.U.S.C.L.E. : Blog.UofMuscle.com . Several readers have suggested a Collectibles Column on the different types of replica title belts. If you are an expert in these items, contact Michael Moore at michaelmoorewriter@gmail.com .